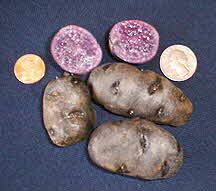 The Purple Peruvian potato is an heirloom trinket from the South American Andes’ highlands. Purple skin and flesh with many distinct eyes. Regarded by many chefs as the “Gem of the Andes”. These purple nuggets make quite a flash accompanying most any entree. Mealiest of the fingerlings, delicious when fried.